Caisson’s generous sponsorship plays its part in our sporting success this year. Many within the Southborough community would agree that this academic year has seen one of the best sporting seasons in memory - and this, it has to be said, has been primarily down to the enthusiasm and hard work of our fantastic students, seeking success both on and off the sports field. Team work across all sporting disciplines has witnessed particular improvement and it’s been a delight to share in the subsequent triumphs of so many sporting teams this year, whether in football, cricket, rugby or hockey. 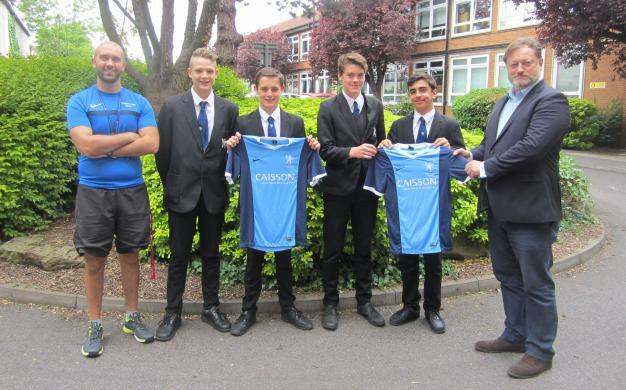 One small but none-the-less rather significant factor which we believe is behind the boys’ success can be attributed to the generosity of companies like Caisson Investment Management, who earlier this year charitably sponsored Southborough’s PE department, allowing us to purchase a wonderfully smart, new kit for our football teams across all year groups. Caisson is an independent investment management group which provides fund and asset management services to both institutional and private investors wishing to access the real estate and alternative investment markets. The word Caisson alludes to a form of deep foundation used in complex projects, often in a challenging environment, where a bespoke innovative solution is required. In layman’s terms, much of the group’s business involves taking on board old, tired industrial estates and through applying the right level and quality of management, breathes life and love into them once more. Earlier this week, Managing Partner of Caisson Mr David Carter visited the school to see for himself how the organisation’s generous donation had made a difference and to also formally present the new kit to some of the players themselves. On behalf of everyone at Southborough High School, we’d like to say a very big thank you to Mr David Carter and Caisson Investment Management for their very generous sponsorship. It really has played its part in our sporting success this year.